The React One Pro is a newer version of Trophy Ridge’s React One. It claims to be faster and more precise compared to other single pin sights, and its easy adjustment settings promise a better and more enjoyable hunt. 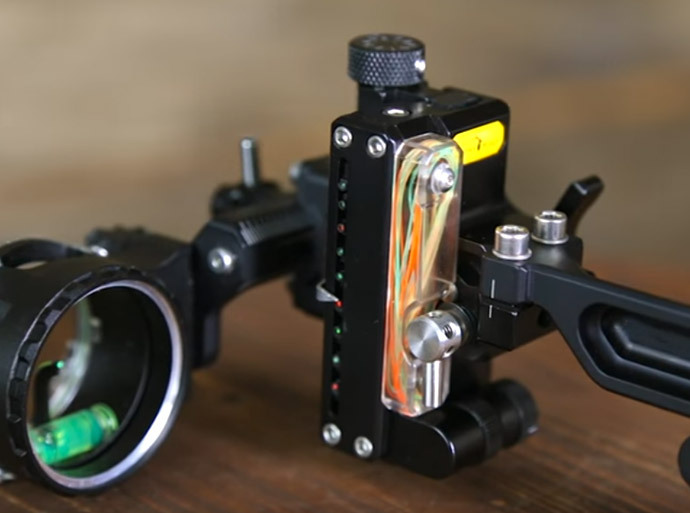 This bow sight can improve your aim and shooting performance only if you’re comfortable with quick sight recalibrations during your hunting game. If you dislike making manual adjustments, then a single pin sight may not be the right choice for you. Pins come in several diameters. If you’re just starting out with bow hunting, you may want to consider the .019” pin. This is what many experienced hunters prefer, because it transmits more light than a .010” pin but covers less area than a .029” pin. If you want a more precise aim, then a .010” pin diameter may be a good choice for you. Note, however, that a smaller pin size transmits less light, so the .010” pin won’t work well in low light. If you aren’t too concerned with precision but want a pin that is visible at night, then you may want to use a .029” pin instead. Remember, though, that a larger pin will cover more parts of your game, so you’ll have a bigger blind spot. Unlike other bow sight models, the React One Pro offers not one but two versions. 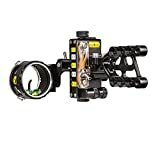 The regular version comes with a hunter bracket with four slots you can choose from, depending on how close or how far you want your sight to be from your eye. Just pick your distance, bolt the slots into your bow via screws, and you’re done. The screws have a tendency to become loose, though, if not properly screwed in. Just make sure to double check their tightness before you set out for your game. If you want the sight to be slightly farther from the riser of your bow, you can get the dovetail version instead. 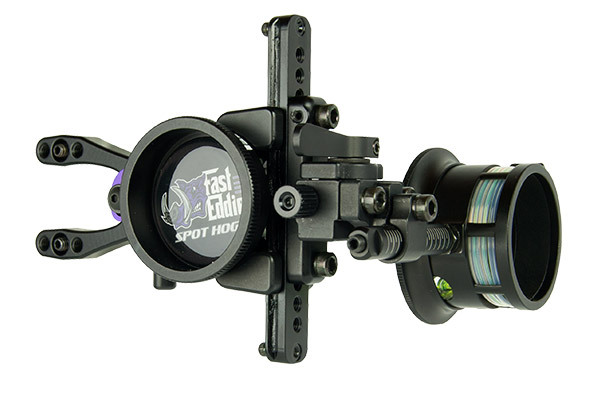 This version is slightly heavier than the regular version, but it lets you easily slide the sight in and out of the mount. The React One Pro helps you make accurate shots no matter the yardage is. With its tool-less adjustment system, it is easy to make changes on the sight to improve your aim. For instance, if you feel that you are shooting your arrows a little high, you can use the sight’s gang elevation adjustment to bring your sight a bit higher so your arrows will hit your target more accurately. This bow sight also has a fiber optic yardage indicator, which is great because it makes the pin visible in almost all kinds of hunting environments. I often schedule my hunts at night because that is when game animals often come out, so I need a pin that I can use to make accurate shots even in low light. This model also comes with a rheostat light, which might help you adapt better to the changing lighting conditions of your hunting environment. This feature would have been so useful when I was chasing a white-tailed deer deep in the woods and ended up using up all the stored light in my fiber. I find this model very easy to adjust. This is mainly because of the manipulable posts for micro-click windage and elevation adjustments. They are very easy to operate, so you can easily make minute corrections to your sight during the game. This video demonstrates how easily you can adjust the sight, depending on the yardage of your game. For example, if your game animal is 20 yards away, just line up your pointer at 20 (topmost dot) and shoot. If you want to shoot game at 30 yards away, all you have to do is loosen the lock lever, turn your crank knob counter-clockwise so your sight moves down to the 30-yard mark, lock the level, and shoot. If you end up buying the Dovetail version, don’t worry! 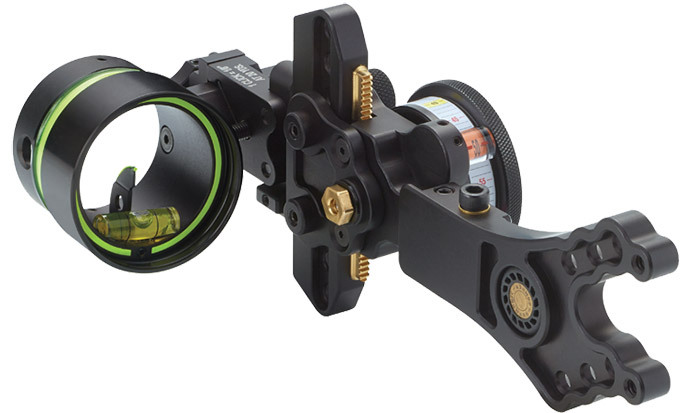 It features a four-knob adjustment system, which makes it easy for you to adjust your sight during the hunt. If you want to loosen the knob, you simply turn them counter-clockwise. Turn them the other way and you lock the slide in place. One of my favorite features of the React One Pro is its React Technology. 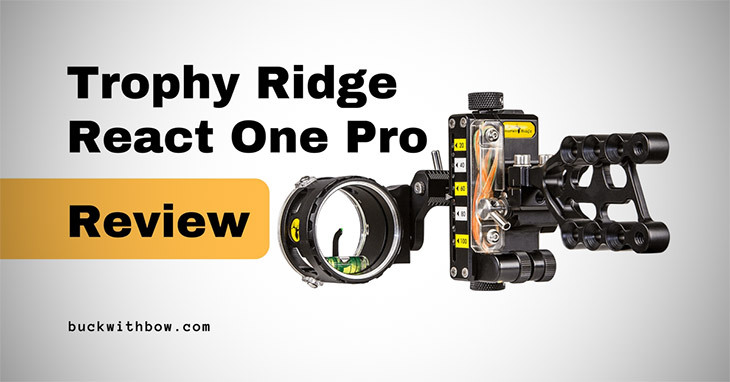 This Trophy Ridge innovation simplifies adjustments on range distances. To use this feature, you just need to set your first yardage at 20 yards, and then set another distance - whether it’s 30, 40, 50, or 60 yards. This feature then automatically adjusts the remaining yardages, saving you time that you can use for hunting your game. It is also very easy to use: Just turn the appropriate knob, lock it in, and you’re good to go. This bow sight is made of machine-constructed aluminum, which is good because it makes the sight durable. Unlike plastic sights, where unfavorable hunting conditions may cause them to crack, the React One Pro can withstand harsh weather and lots of movement, which are necessary when you’re chasing your game. Also, because the design on this bow sight is so compact, all important parts are placed closely together, making it unlikely that you’ll end up with a missing piece after your hunt. However, this does make the model a bit on the heavy side, adding a little to the overall weight of the bow. 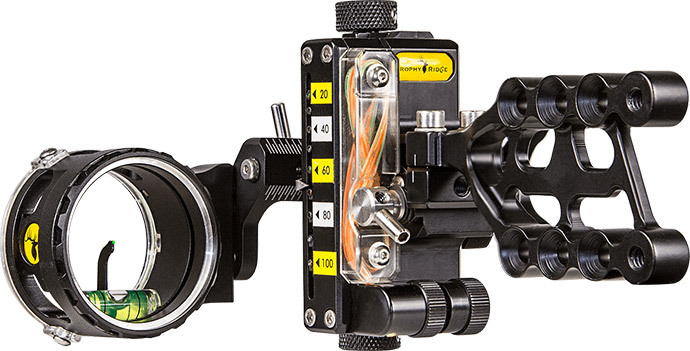 The fiber of this bow sight is encased in a thick plastic box attached to the sight’s body. This is a good thing because your fiber is protected from outside elements that may cause damage to it. Remember that a cracked fiber will not transmit as much light into the pin as a good one. Spot Hogg Fast Eddie ReviewsSpot Hogg’s Fast Eddie models are known for their light weight, so you should consider this brand if you put the pin sight’s weight over ease of use. If you are on a budget but you want a good-quality dovetail model, you can save a few dollars if you buy the Fast Eddie XL. HHA Kingpin models are by no means easy on the wallet, but they make up for it with so many useful features. If you want nifty add-ons like exchangeable yardage wheels, a yard tape magnifier, and a blind lock feature, then you may want to check out HHA’s products. The React One Pro is easy to set up and even easier to adjust. There is no need for complicated modifications, so even beginner archers and hunters can use it with little to no problem. Its tool-less micro-click windage and elevation adjustments save you the trouble of struggling with a wrench or screwdriver in the middle of your hunt. And its unique React Technology gives you the confidence that your sight will always be accurate. If you think this model suits your needs, be sure to check out its Hunter Bracket version or the Dovetail version.